Catification has become a buzz word on the internet since US cat behaviourist Jackson Galaxy first used it on Animal Planets TV series My Cat From Hell. It has become THE thing to do if you have a cat that demands the perfect home. 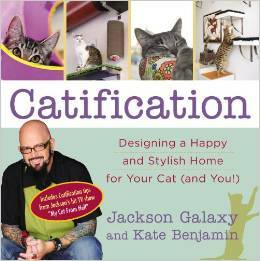 You can click on the image below to buy Jackson Galaxy’s’ and Kate Benjamin’s brilliant book Entitled Catification. 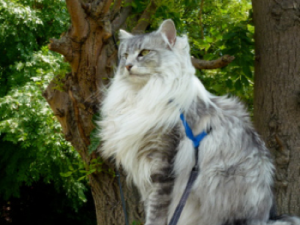 I have two beautiful Norwegian forest cats, one pictured above, and I have started to catify my home to give them some stimulation with climbing and grazing up high. There are endless ideas on the internet with people doing DIY catification jobs in their homes and then posting their photos and projects on line. I made a post on my blog detaling the catification I have started in my urban one bedroom apartment and intend to write about part 2 soon! Jackson Galaxy would be proud of me – i think!!! Start getting creative It’s so much fun and your cat(s) will love you for it.